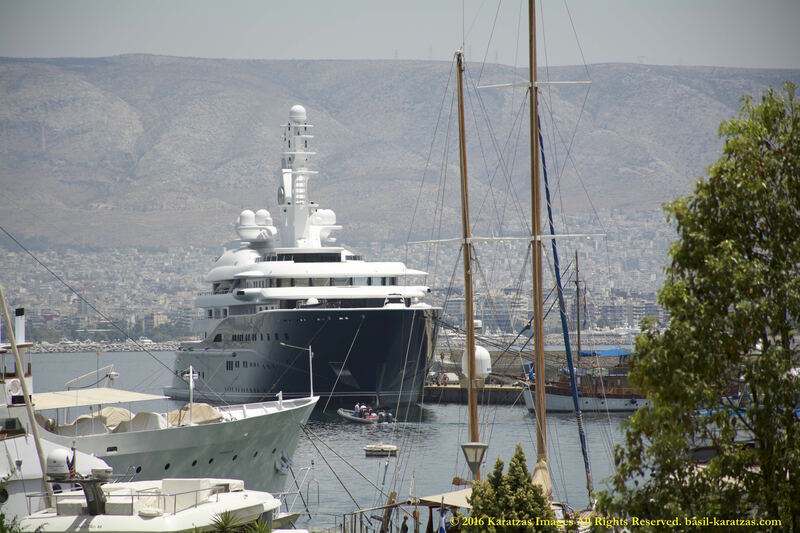 Posted on June 19, 2016 by Karatzas Marine Advisors & Co.
‘Al Mirqab’ is a 133m motor yacht built in 2008 by Peters Schiffbau in Wewelsfleth. 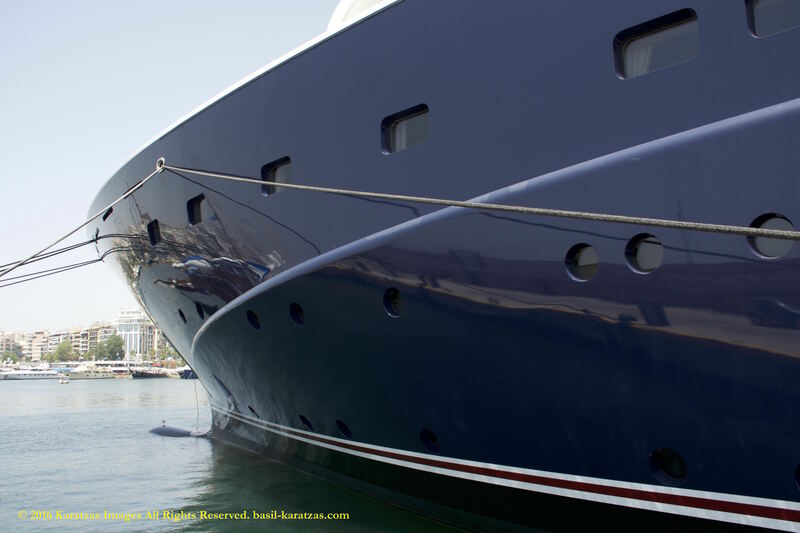 The yacht’s stunning exterior was designed by Tim Heywood, whilst her interior design is the work of Andrew Winch Designs. 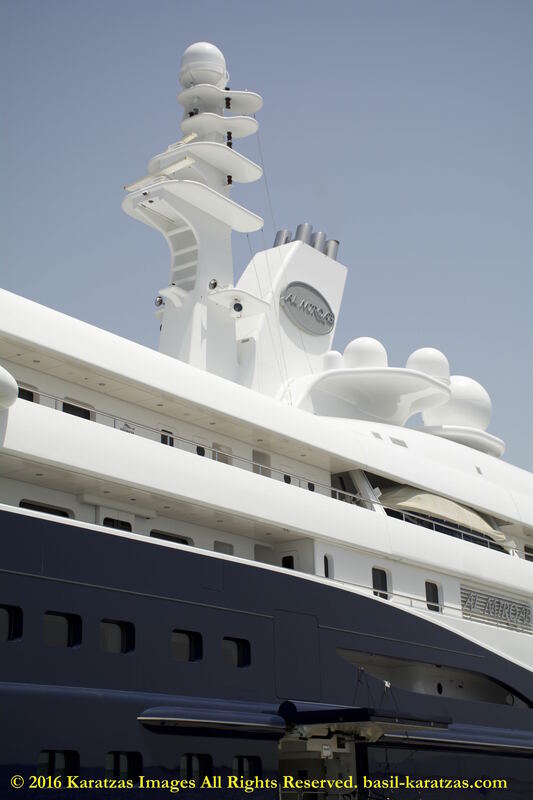 Kusch Yachts was the naval architect involved in the professional superyacht design work for ‘Al Mirquab’. Her interior design was realized by Andrew Winch. Kusch Yachts and Tim Heywood is also associated with the yacht general design work for this boat. 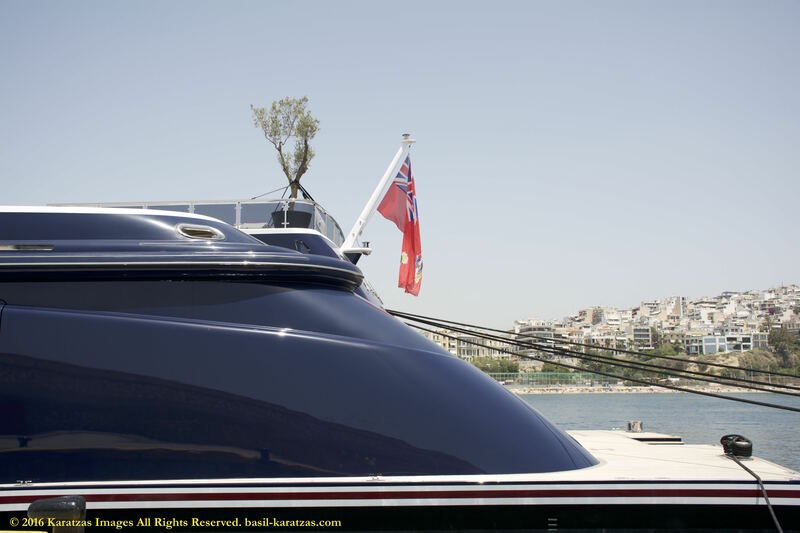 Germany is the country that Kusch Yachts completed their new build motor yacht in. After the formal launch in 2008 in Wewelsfleth, she was afterwards delivered on to the proud owner following sea trials. 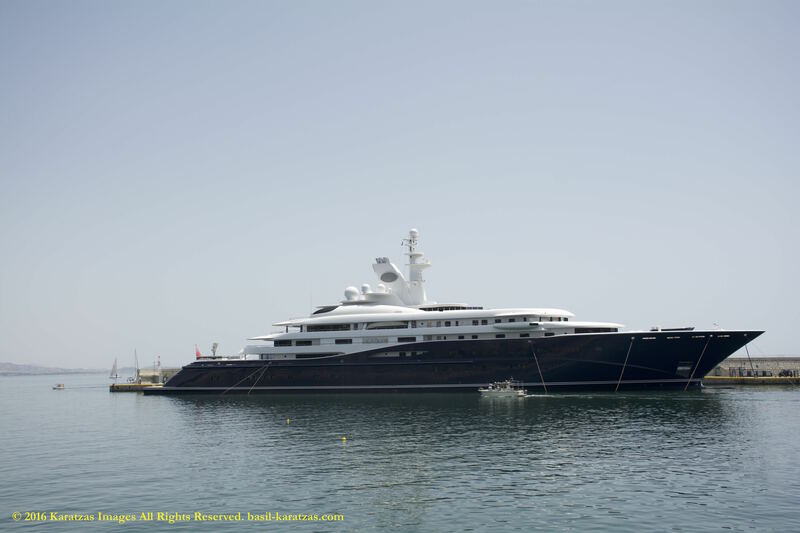 Built for Qatar’s Prime Minister and Foreign Minister Hamad bin Jassim bin Jaber Al Thani, Al Mirqab is one of the largest and most beautiful yachts on the water. 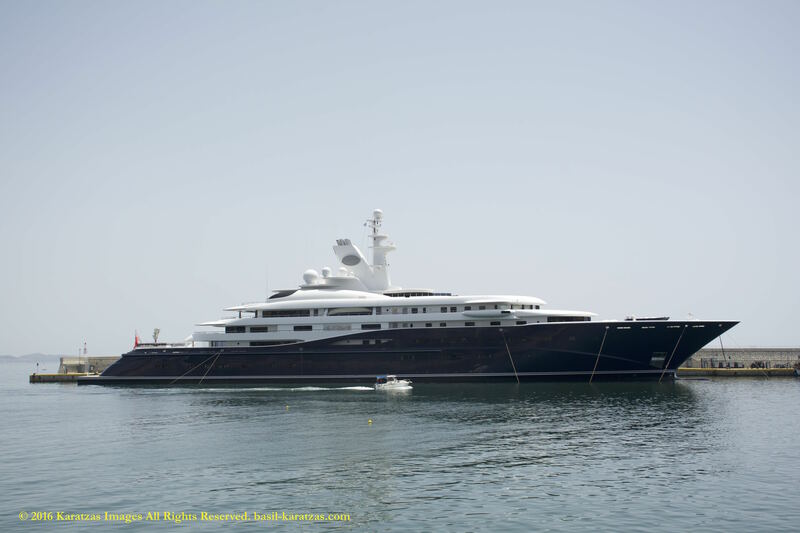 The yacht won the coveted ‘Motor Yacht of the Year’ award at The World Superyacht Awards 2009 and won ‘Best Interior Design’ in the motor yacht category for her Andrew Winch-designed interior. Her main hull was constructed with steel. 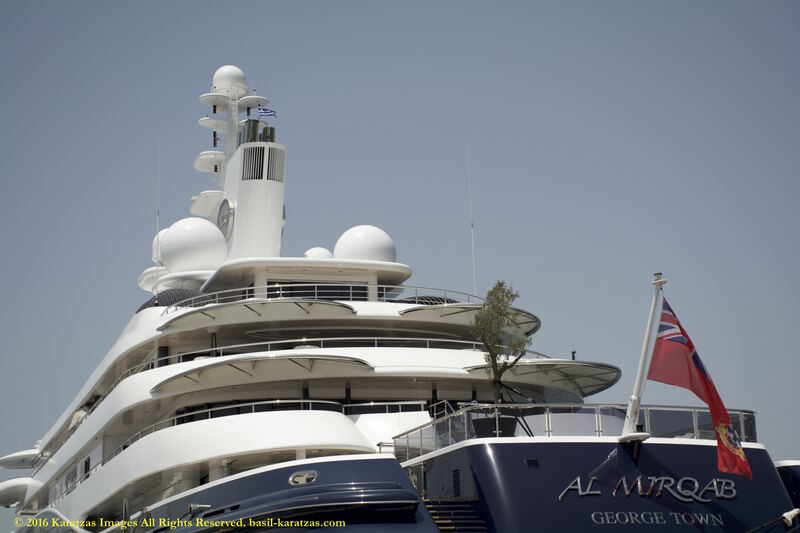 The motor yacht superstructure is made largely with aluminium. 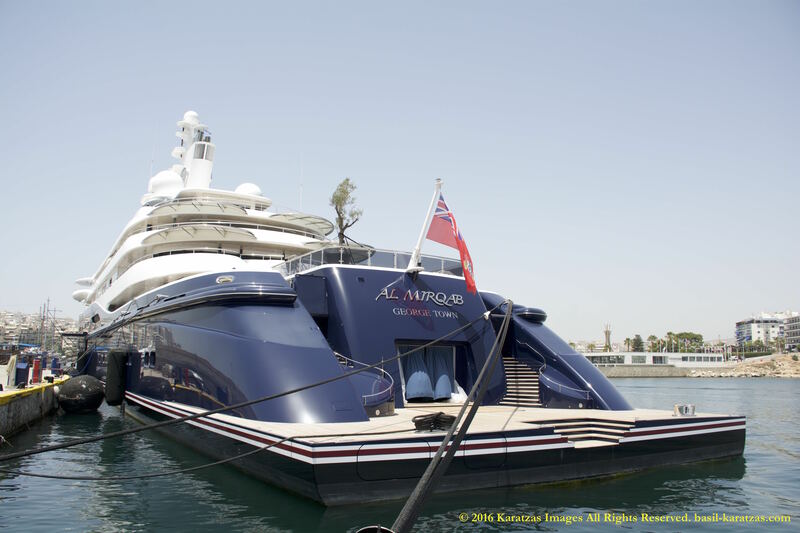 With a beam of 19.5 m / 63.98 ft, ‘Al Mirqab’ has massive size. 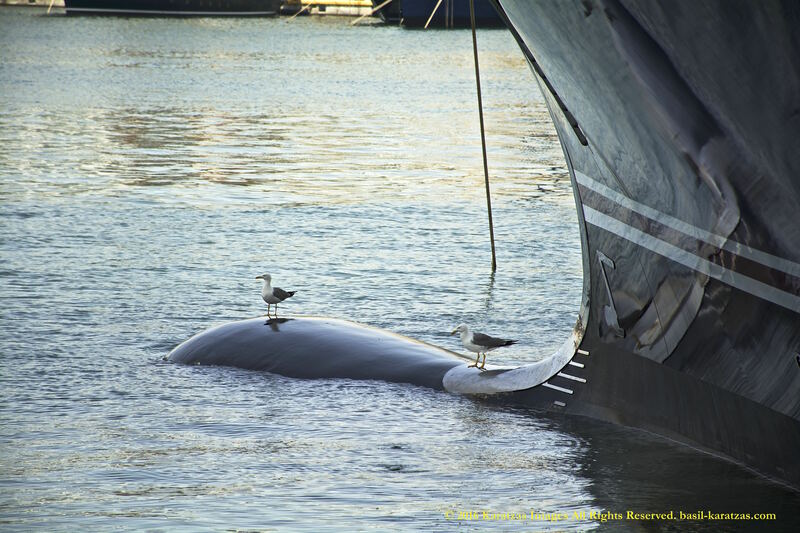 A reasonably deep draught of 5m (16.4ft) affects the list of certain harbours she can berth in, contingent on their specific depth at low tide. 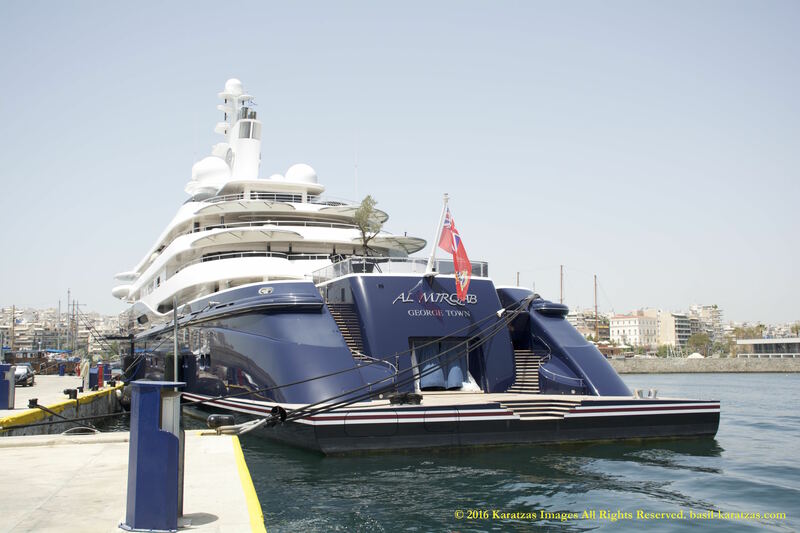 ‘Al Mirqab’ has an aluminium superstructure and a steel hull with a generous beam of 19.5m and a 4.9m draft. 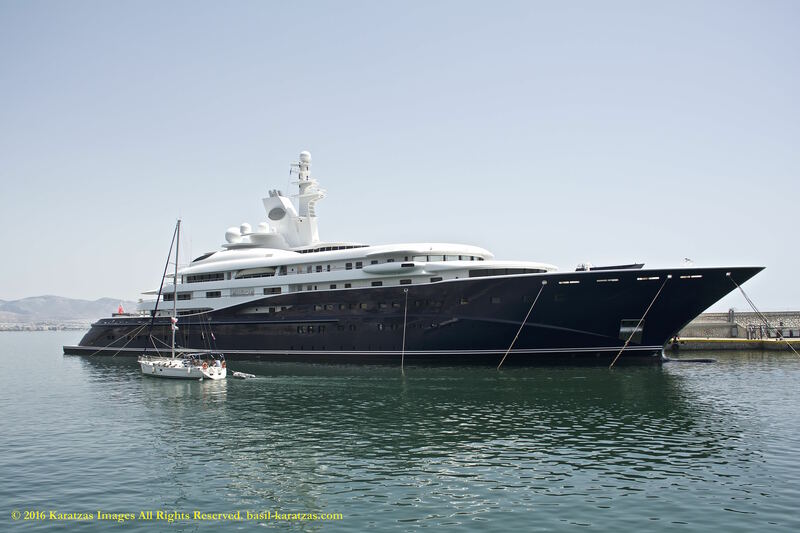 She can accommodate 24 guests in 10 guest suites with two VIP suites for the yacht owner. The suites are large; each with their own bathroom, living room and double bedroom. 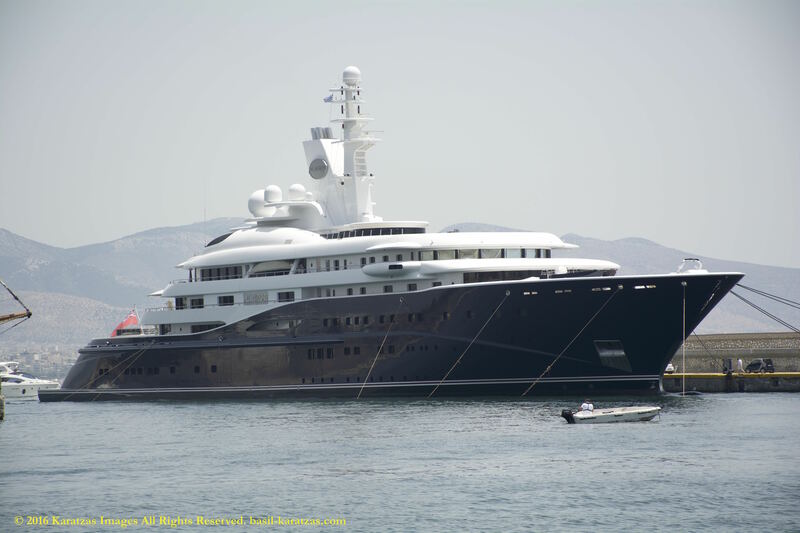 The yacht has a crew of 55 and is capable of carrying up to 60 crew members onboard. 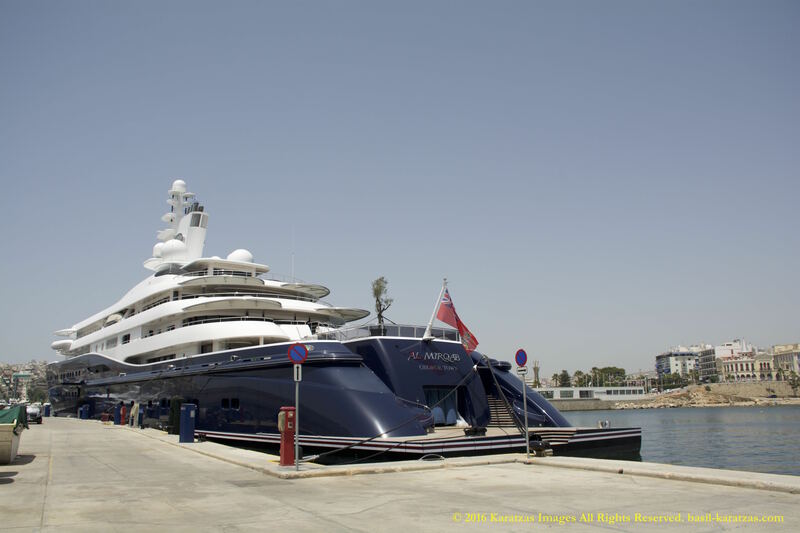 The 133m displacement yacht is capable of an impressive 23 knots, with a cruising speed of 21 knots. She also features ‘at anchor stabilisers’ which work at zero speed, increasing onboard comfort at anchor and on rough waters. 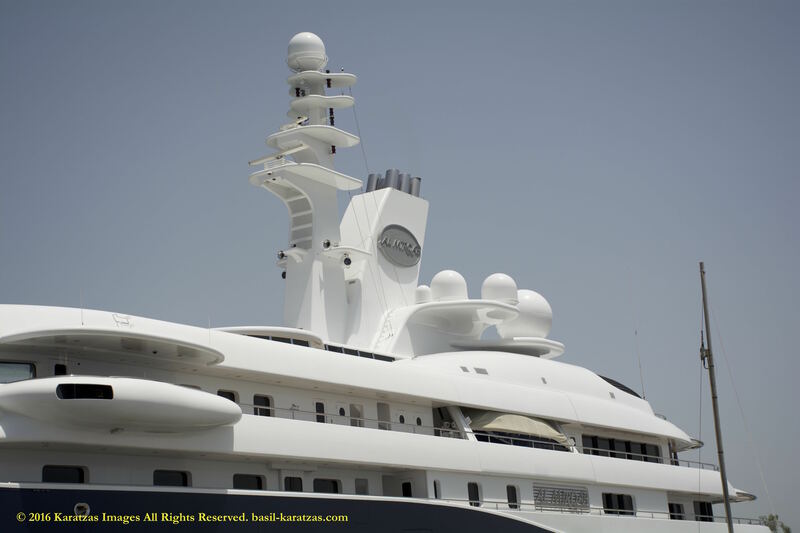 Some of the amenities on board include: a cinema, outside bars, inside swimming pool and outside jacuzzi, sunbathing places, and a helicopter pad. 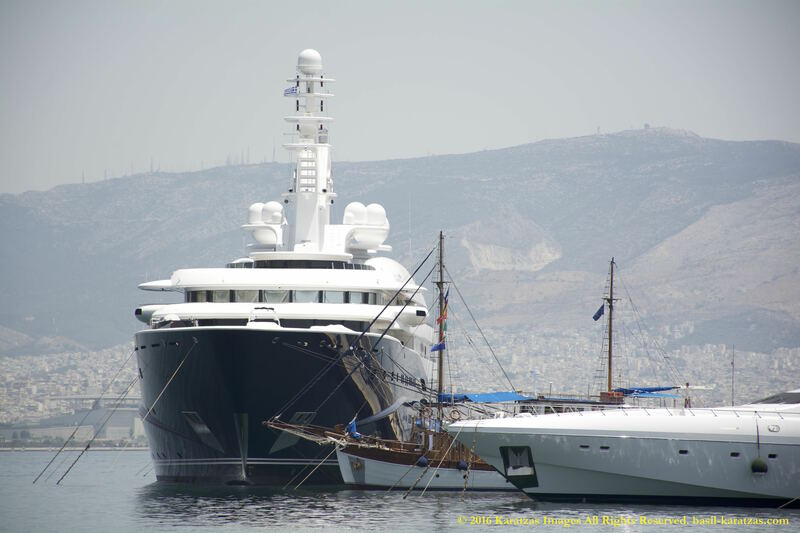 Max/Min Speed & Main Engines: Coupled to the M/Y ‘Al Mirqab’ engines are twin screw propellers. Her total HP is 13400 HP and her total Kilowatts are 10000. 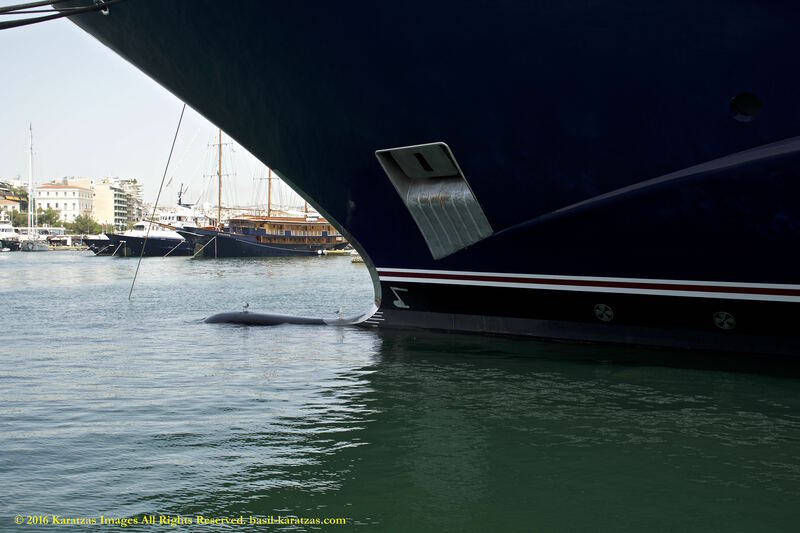 For bow thrusters she utilizes X2. 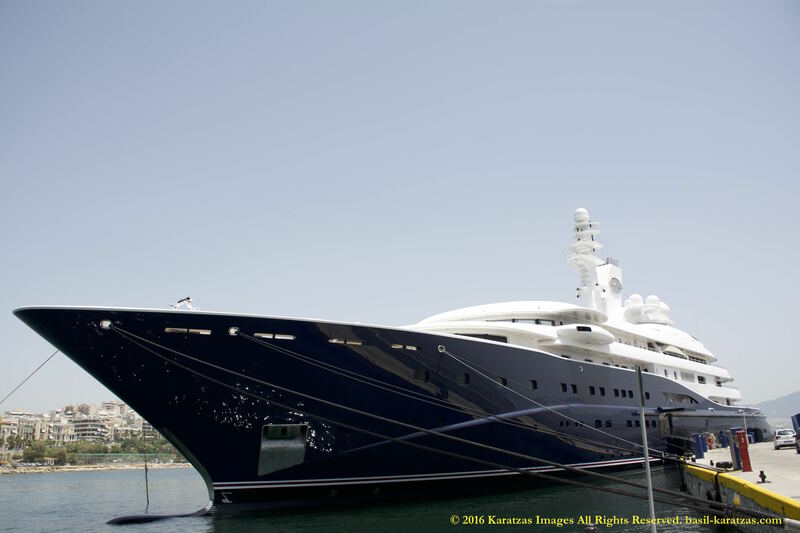 The newbuilding cost of the M/Y ‘Al Mirqab’ was reported at US$ 300 million. 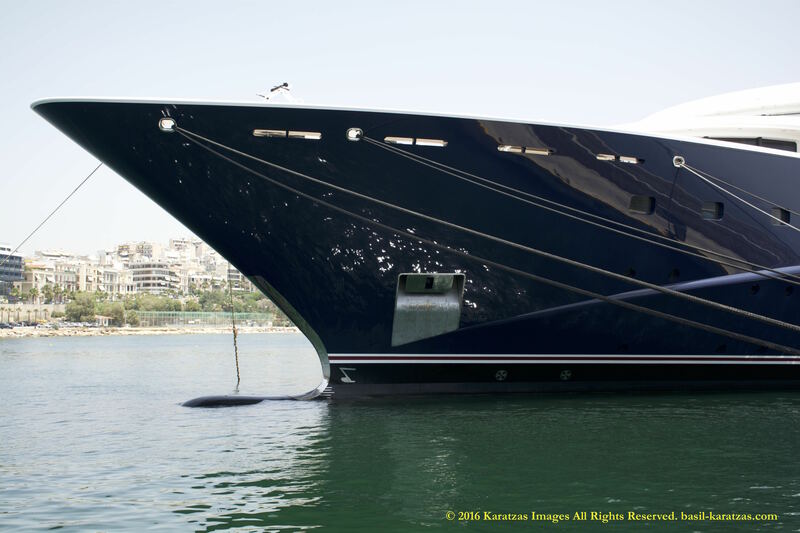 Posted on June 11, 2016 by Karatzas Marine Advisors & Co. 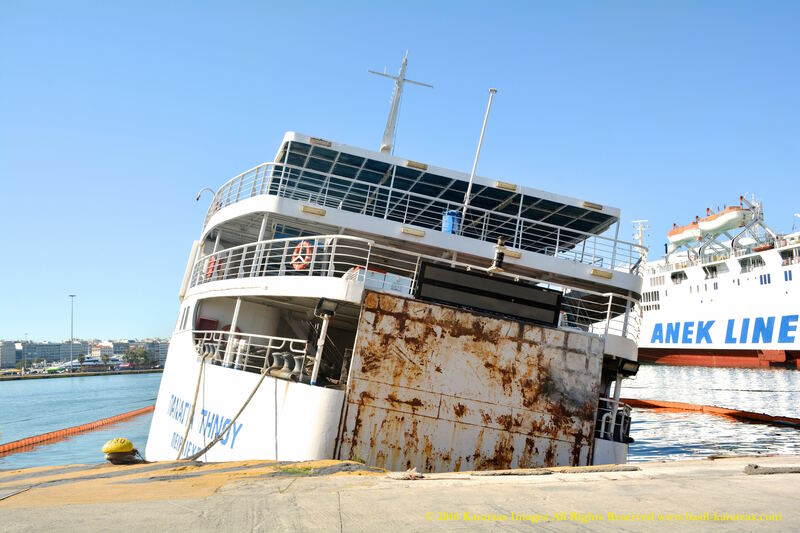 In late April 2016, while docked in the Port of Piraeus (Gate E4), ferry boat MV ‘Panagia Tinou’ started listing to its starboard side due to ingress of water. 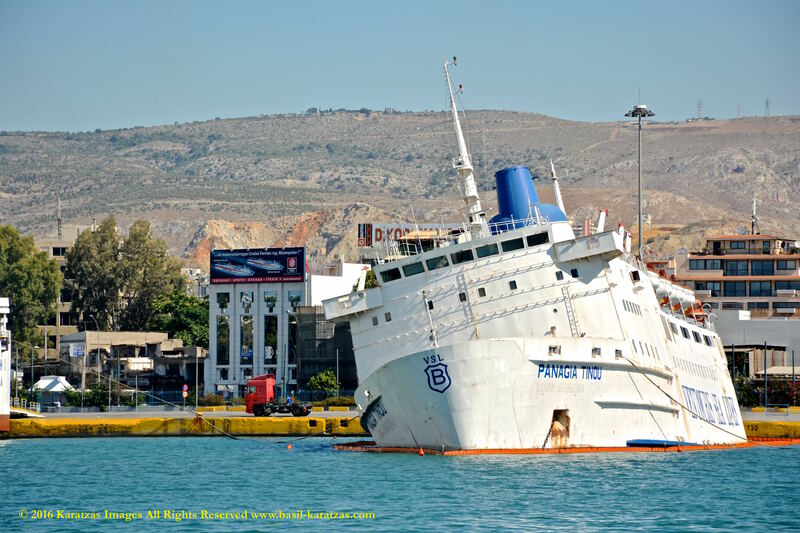 The vessel was under arrest at the time of the listing at the request of the creditors due to outstanding bad debts. 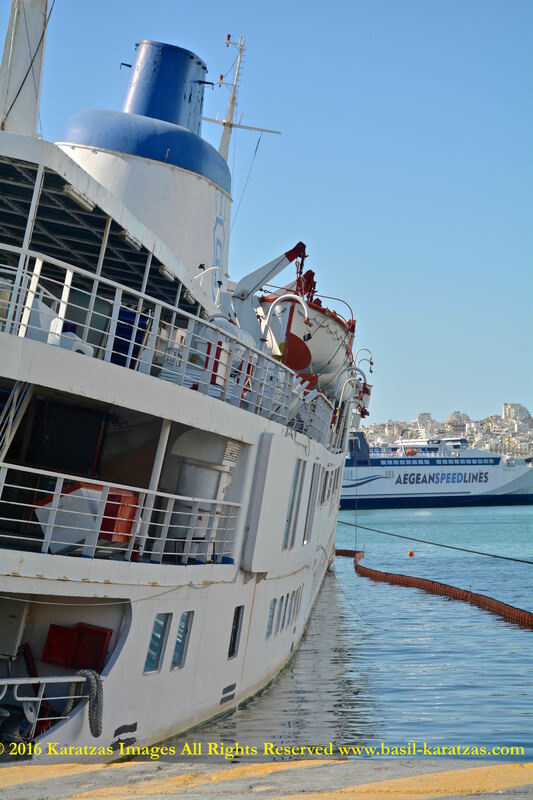 Following pictures were taken in early June 2016, showing that the vessel is getting lower into the water as compared to original pictures from late April 2016 when water first started ingressing. 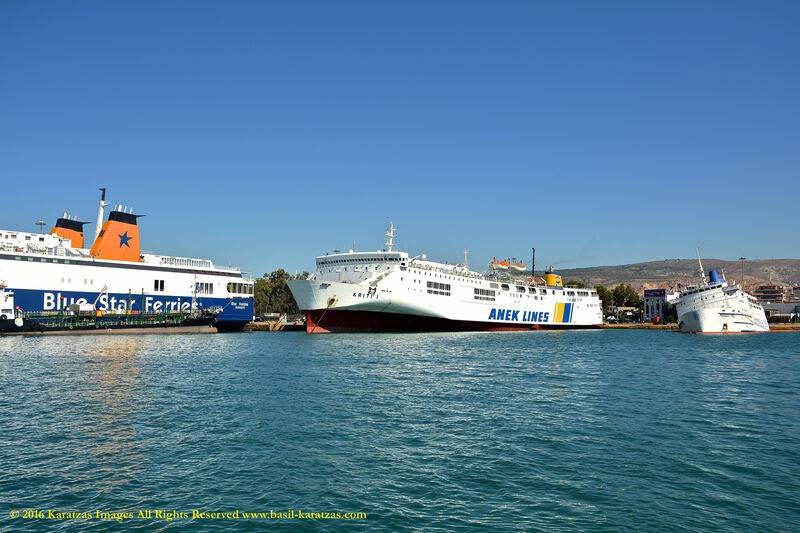 In very close vicinity, several ferries are continuing their business and their voyages to the Greek Islands, when seafarers and Port of Piraeus employees are not on strike, that is… As unsafe as it may be to tow the vessel to a repair dock in the Port of Piraeus, one can only wonder what would happen if MV ‘Panagia Tinou’ suddenly sinks or capsizes in its present location in the main port, the potential risk to vessels in vicinity and the also the repercussions from the closure to several docks in the Port of Piraeus or how long will take to lift the vessel from the bottom of the port… Security personnel from the Port of Piraeus were observed to smoke furiously by the cordoned area around the vessel, thus we can surmise that the situation is under someone’s watchful eye. 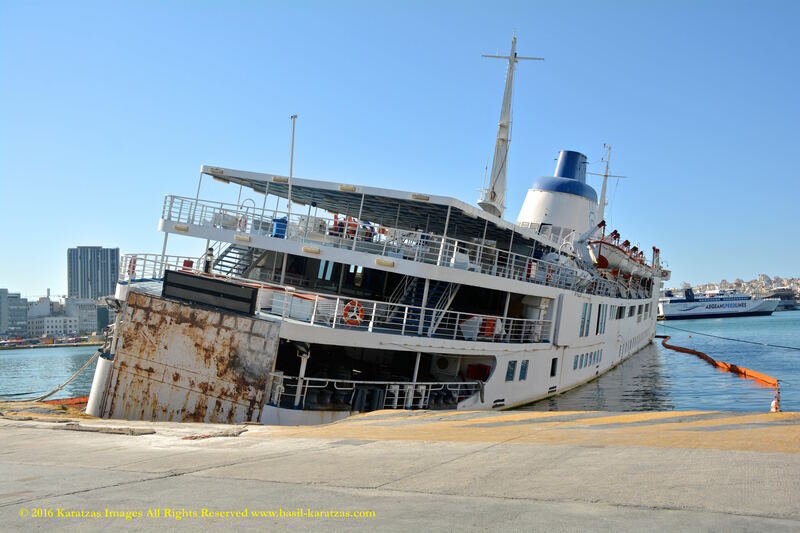 The ferry MV ‘Panagia Tinou’ is named after the famous shrine of the Virgin Mary on the Island of Tinos, in Cyclades. 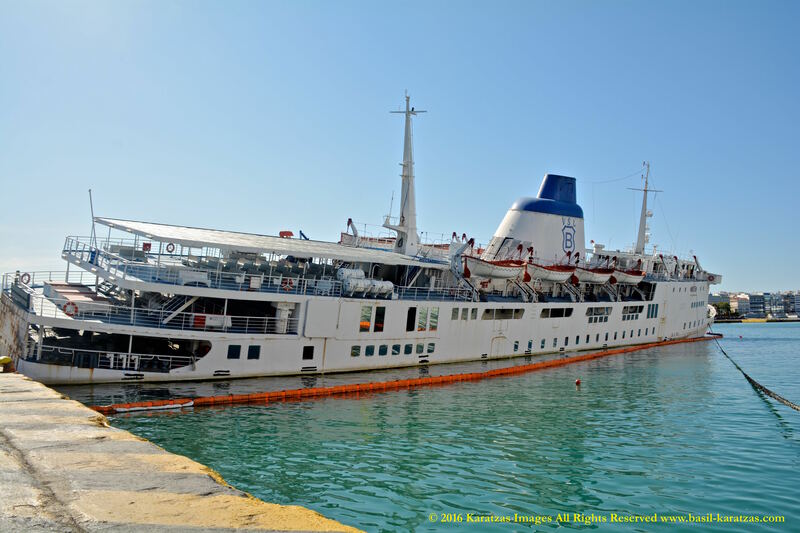 The vessel used to served the Islands of Tinos, Paros, Naxos and Santorini most of her time while plowing Greek waters, and has been boarded by and graced the memories of many a tourist, while from Greece or overseas. 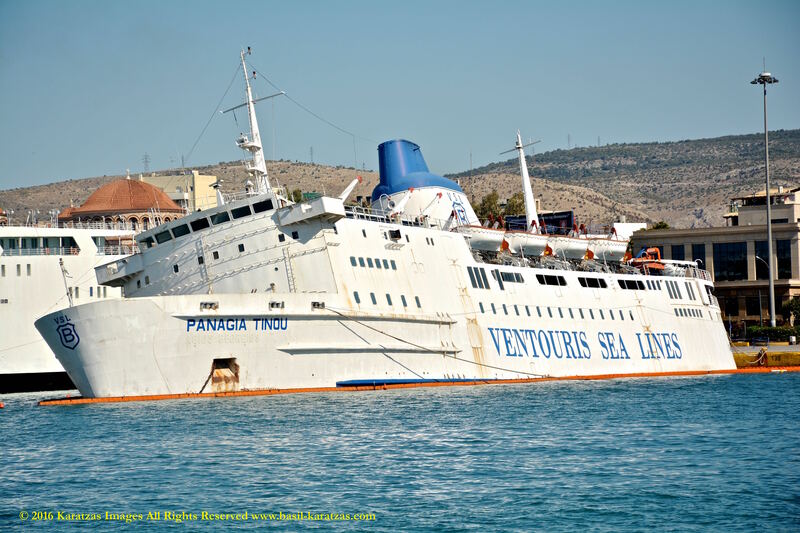 The ferry MV ‘Panagia Tinou’ was built for Sealink as MV ‘Hengist’ in 1972 in France at Arsenal de la Marine National Francaise with the intend to serve the routes of Dover / Folkestone and Calais / Boulogne along with her sisterships MV ‘Horsa’ and MV ‘Senlac’. Sealink in 1984 was acquired by Sea Containers and in 1990 to Stena to create Stena Sealink. 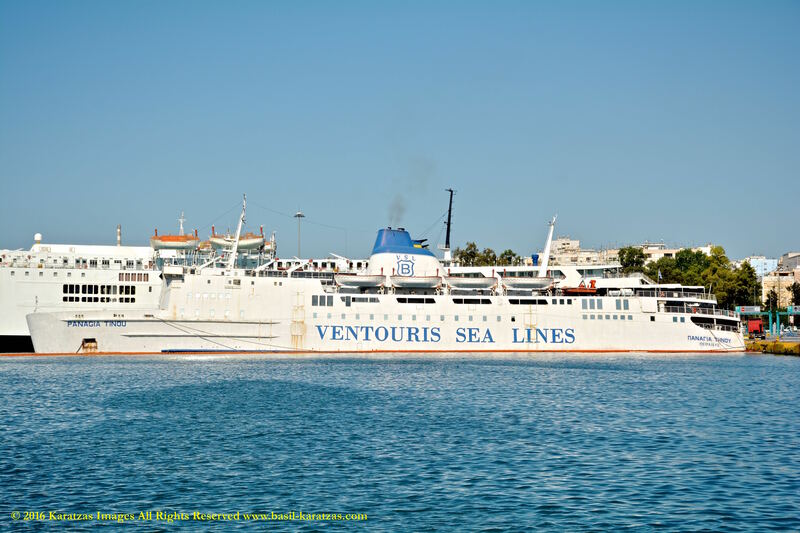 In 1992, the vessel was acquired by Clients of Agoudimos (GA Ferries) in Greece for US$ 5.2 million and re-named MV ‘Romilda’, while in 1993, she was sold for the first time to Ventouris Sea Lines for $11.9 million; subsequently, Ventouris Sea Lines acquired the sistership MV ‘Senlac’ and brought her to Greece as ‘Apollon II’. 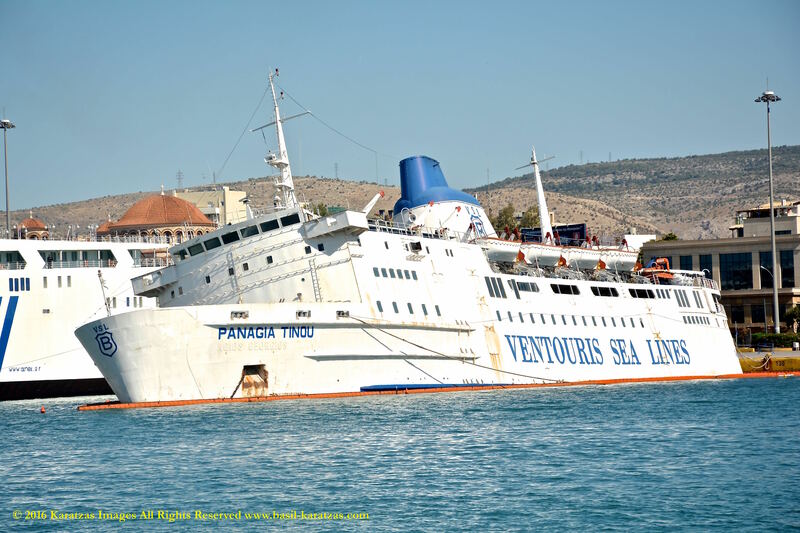 In 1996, she was sold to Agapitos Group (Agapitos Lines) for US$ 10.5 million. 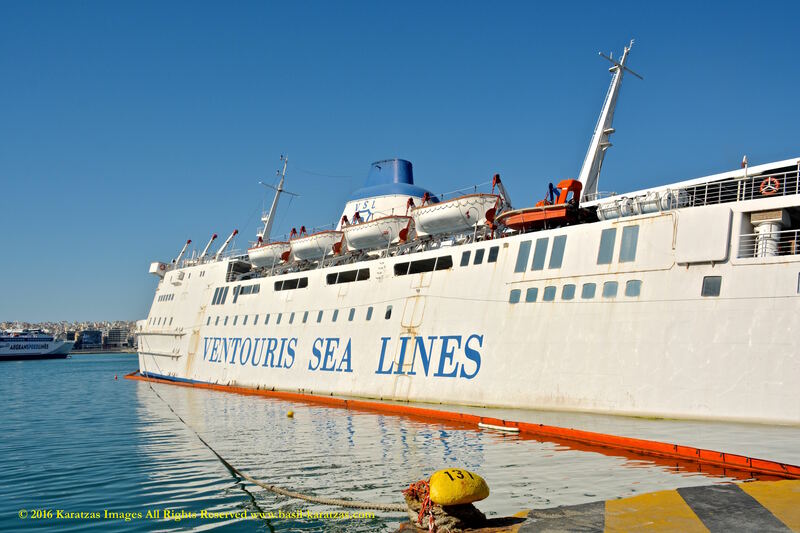 In 1999, she was sold to Minoan Flying, and in 2004, she was sold for the second (and last time) to Venturis Sea Lines, whose house colors are presently painted on the smokestack. 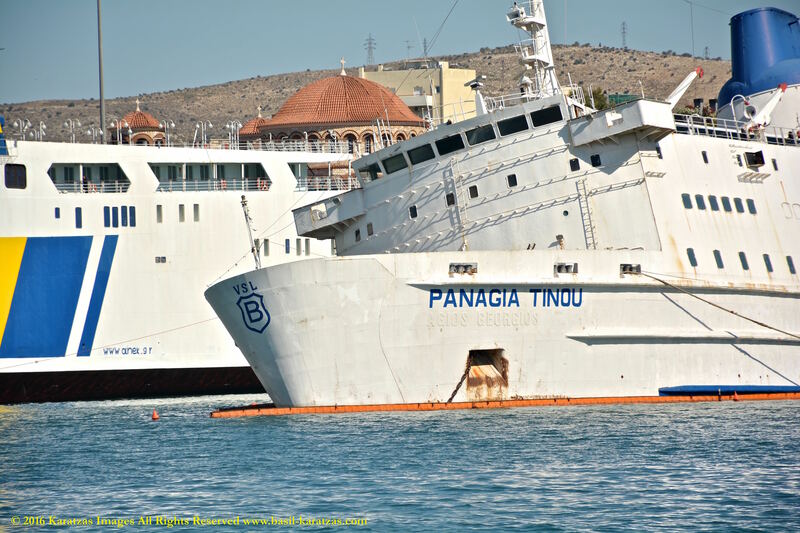 More information on the vessel MV ‘Panagia Tinou’, in Greek, can be found on Ships at Port of Piraeus website. 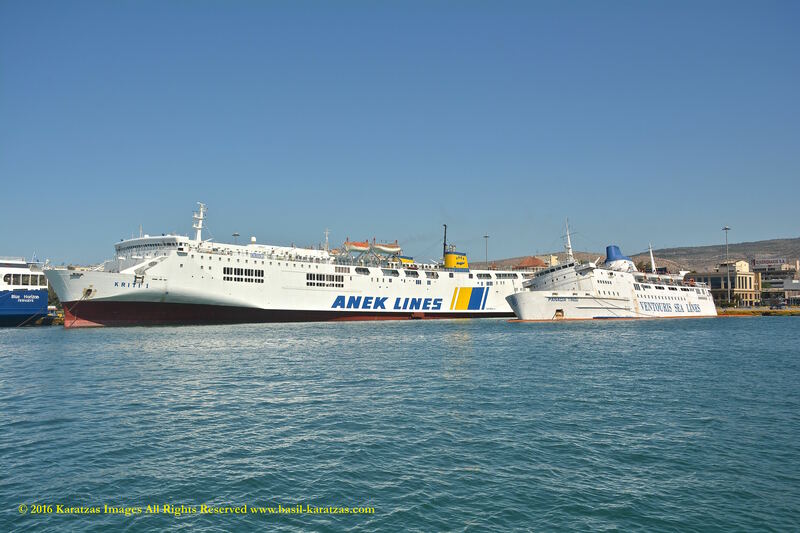 VESSEL DESCRIPTION: Ex-names are Agios Georgios, Panagia Ekatontapyliani, Express Artemis, Panagia Ekatontapyliani, Apollon Express 2, Romilda, Stena Hengist, Hengist. Call Sign SWXF, IMO Number 7205063. 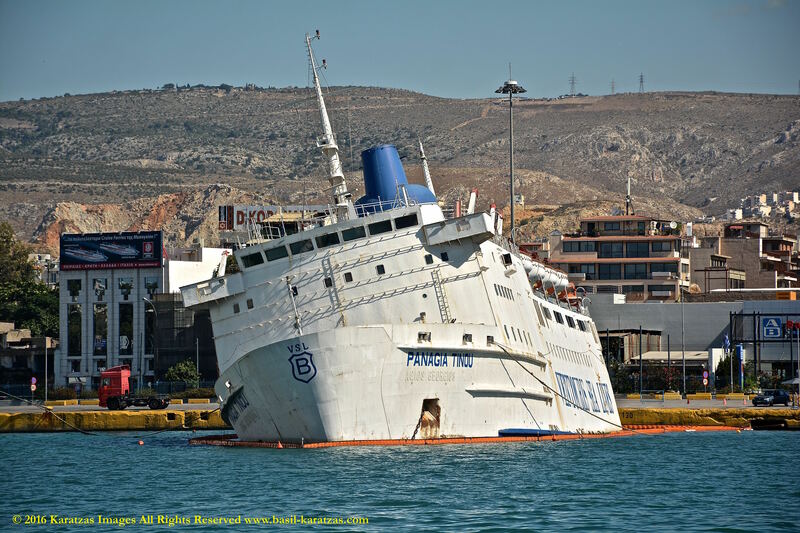 Built at D.C.A.N., Greece Flagged, Length Overall of 117.50 m., Length Between Perpendiculars of 110.20m., Draught of 4.40 m., Beam of 19.20 m., Moulded Depth of 6.17 m., Tonnage of 2,610 International Net and 1,033 Dwt (long), Gross Tonnage of 5,120, Speed of 19.50 kts, Marine Diesel Oil, Horsepower of 15,000 BHP. 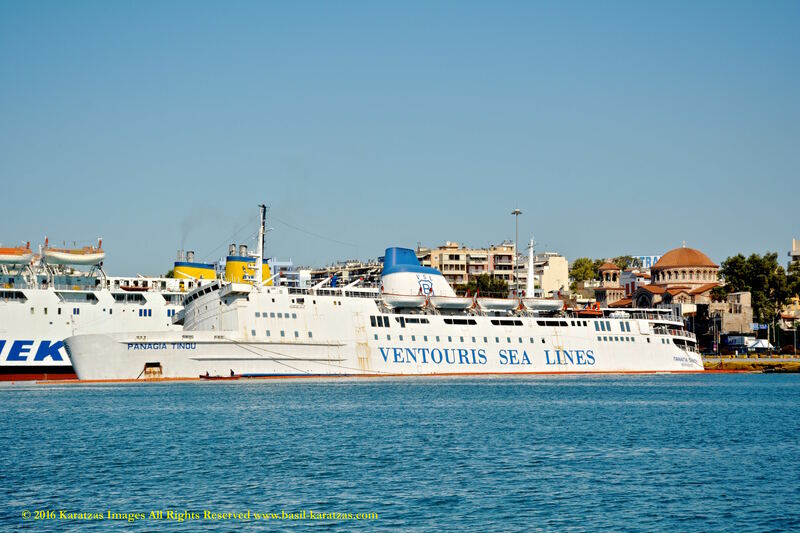 OWNER / MANAGER DETAILS: Ventouris Sea Lines, 2, Kapodistriou Street &, Akti Possidonos, Piraeus, Greece. 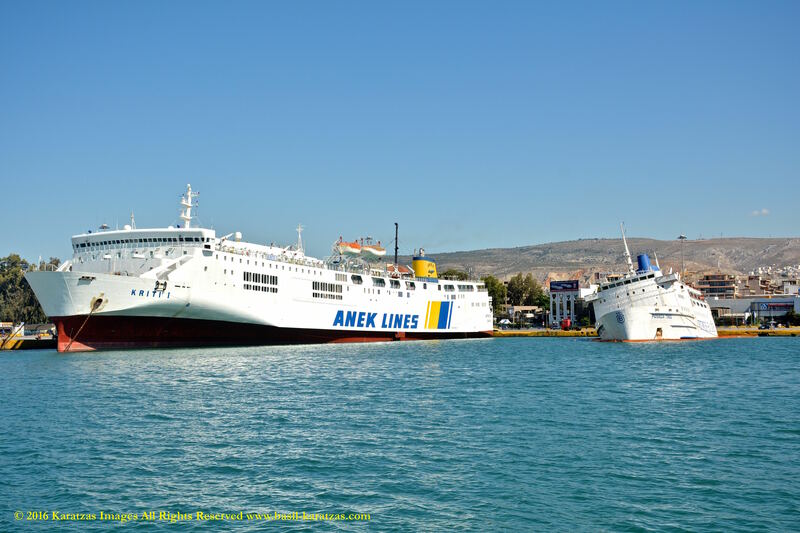 SPECIALIZED DETAILS: Vehicle Capacity of 217 Cars, Lane Length of 450.00 m., 1 Stern Ramp(s). 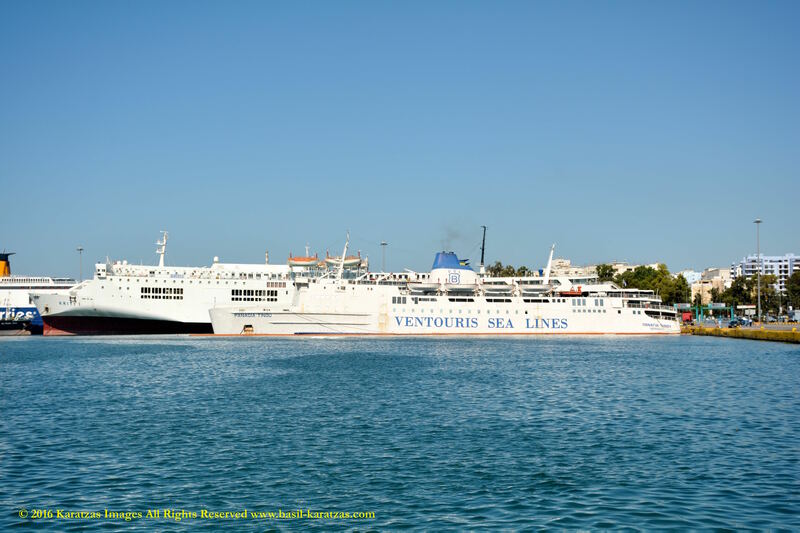 Total number of Passengers 1,621, 110 Passenger Berths. MAIN ENGINE: 2 x Diesel – Pielstick 16PC2.2 – 4-stroke 16-cyl. 400mm x460mm bore/stroke 11,032mkW total at 500rpm. AUXILIARY ENGINES: 3 x Aux. Diesel Gen – 4-stroke 1,680mkW total driving 3 x AC generator(s) at 1,680ekW total, (2,100kVA total) 415V, 1 x Emergency Gen – 4-stroke 150mkW total driving 1 x AC generator(s) at 150ekW total, (188kVA total) 415V.